You might remember that back in May, I went to Chicago with Verizon Wireless as part of the Savvy Gourmet program. As part of this trip, Verizon treated us to a “secret” dinner with Chef Efrain Cuevas who started an underground supper club in Chicago. The team kept the location and details of the dinner a secret all day. We were taken by bus to a location that I know I would not be able to find again. We found ourselves in front of a gorgeous old convent. Everyone seemed a bit skeptical but we proceeded and I was completely blown away by the location. A beautiful grassy area, open air dining space, brick walls, concrete floors, modern but amazingly rustic. Chef Efrain told us that the theme of the food would be grilled meats and seasonal veggies and I was totally on board. 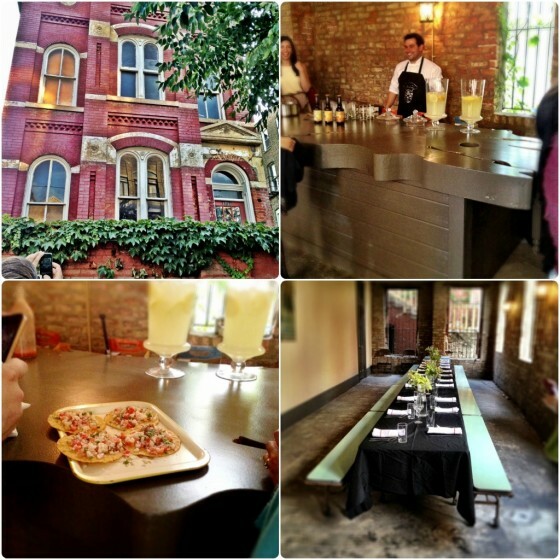 The meal was so elaborate – five courses and each was skillfully prepared and wonderfully flavorful. But my favorite wasn’t the spicy shrimp, or the Cornish hen or the homemade shortcake. It was the appetizer – the snack – I bet you are not shocked. Chef Efrain served us a spicy, tangy, vegan ceviche with cauliflower, Serrano chiles, onions, tomatoes and cilantro. What is not to love? I instantly fell in love and was nearly full from the appetizers before we even sat down for the meal. This ceviche has been on my list to make since I got home because I haven’t been able to get it out of my brain. 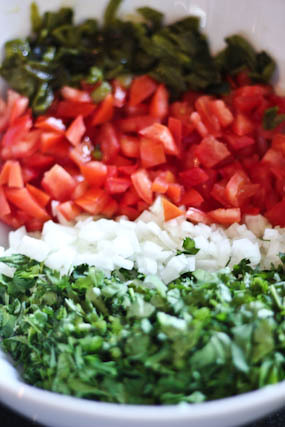 It would make the perfect appetizer, dip or salad for any party. It is so simple and so flavorful! 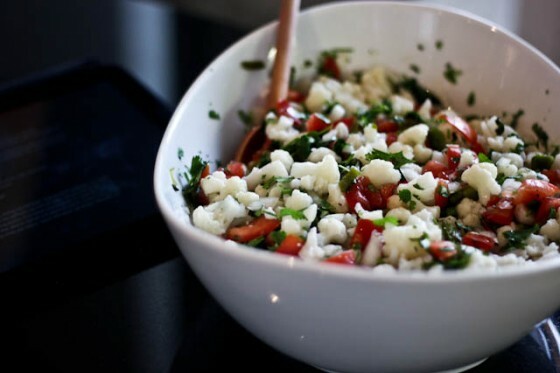 A vegan ceviche recipe with lime juice-marinated cauliflower, onions, tomatoes, roasted poblano peppers and cilantro. Bring a large pot of salted water to boil. Trim the leaves and stems of the cauliflower and discard them. Break up the large cauliflower florets into small pieces. Blanch the cauliflower pieces in salted, boiling water for 5-6 minutes. The cauliflower should begin to soften but should not be completely cooked. Drain the water and immediately move to an ice bath to stop the cooking. Allow them to cool. Drain from the ice bath and chop into small pieces. I started out chopping but ended up just breaking apart the larger pieces. In a glass bowl, combine the small cauliflower pieces with the lime juice. Refrigerate for at least two hours. The cauliflower will absorb some of the lime juice as it marinates. Stir occasionally. Combine the marinated cauliflower with the tomato, roasted peppers and cilantro and season with salt to taste. Serve with tortilla chips, corn tostadas, etc. Chef Efrain's used Serrano chiles & plum tomatoes. I couldn't get Serrano chiles at my farmer's market so I subbed poblanos, and already had Roma tomatoes on hand. I say go with whatever you can easily access locally! To roast the poblano peppers: preheat broiler. Place the poblano peppers on a baking sheet and place them under the broiler. Broil until the skin is blistered and charred, rotating with tongs as necessary. They should be completely charred in about 20 minutes. Remove the charred peppers from the oven and place them in a glass bowl and cover with plastic wrap. Let them sit and sweat for about 20 minutes, the skins will begin to pull away from the flesh of the peppers. Remove the charred skins, open the peppers and discard the seeds and roughly chop the flesh. I have loved using my Xyboard so far. 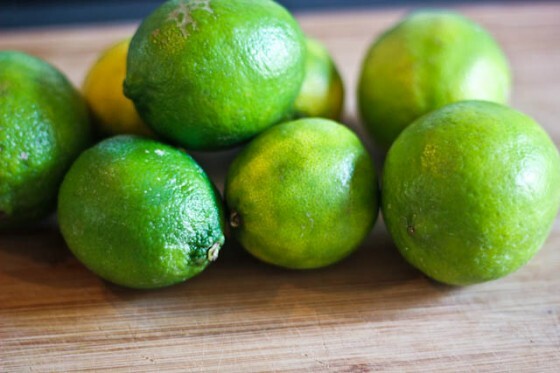 It’s amazingly simple to make recipe notes in the kitchen and it is super simple to clean when you get lime juice all over it. Oops! I have loved the ability to look up recipes, like Chef Efrain’s cauliflower ceviche recipe, on the Xyboard. Disclosure: I am participating in the Verizon Wireless Midwest Savvy Gourmets program and have been provided with a wireless device and six months of service in exchange for my honest opinions about the product. Learn more by clicking here. Hands down my favorite dish that night. I think I had 3… yikes! No wonder I couldn’t finish my dinner! I can’t wait to recreate this. Thanks, Cassie! Yum! I love cauliflower and I am always looking for new, interesting ideas with it – this definitely fits the bill! This looks absolutely awesome – so creative my dear!! My hubs lived in Chicago 40 years before we left there and I lived downtown in places that look like the pics you posted and seeing them, I am reminded of the AMAZING food scene Chicago has (and the snow – ugh). So glad you had a great and memorable trip there! This is awesome! I have a whole list going of cauliflower things I need to try out/make (pizza crusts, “rice”…) and this is getting added to it. Such an underrated veggie! Sounds great! Definitely on my to make list! Honestly, this is one of the most creative things I’ve seen all week. Who would have thought of ceviche without fish?! I remember the pictures of that dinner! Beautiful location and still fun to hear about the meal. Thank you!! We just bought cauliflower yesterday!!! I love cauliflower! This looks amazing! Great recipe! I love Chicago! Eddie is from there so I’m lucky enough to get a lot of visiting time – your trip looks awesome! And so does this ceviche! I almost always have a head of cauliflower in my fridge; I’ll let you know how this turns out, because I’m definitely making it! Happy weekend, Cassie! That secret dinner looks like so much fun! Thanks for sharing pictures. And this ceviche is just genius! I can’t wait to make this. This looks so fresh and healthy, love it! What a fantastic recipe and so different! I love it! I’ve never had traditional ceviche because I don’t eat fish, so I’m totally intrigued by this idea. I’ve had raw cauliflower salad that’s marinated in lemon juice, but this sounds even better! I’ve never had anything like this, it looks so fresh and amazing! Cauliflower ceviche? WOW that sounds already attractive by the name and it looks delicious! This secret location looks beautiful too – must have been a wonderful event! Thanks for remembering the delicious appetizer so you can share it with us! I love cauliflower and this is a really nice cauliflower recipe! I love this! I have to admit that I am not always a fan of ceviche, but this looks fantastic with the cauliflower! Fantastic idea! So fresh & super clever! I love cauliflower but have never tried anything like this – love it! What a great dish! I love the citrusy and spicy flavors of ceviche. This looks fresh and delicious – totally new take on ceviche! I like it!! Cassie this is wonderful. It looks so fresh and pretty. Such a fun and interesting dish! Sounds like a keeper and a great way to use cauliflower! I love ceviche! How interesting to make it with cauliflower. I always make mine with shrimp. Thanks for sharing this recipe. I’m really excited to try it! I remember the trip, I loved following the tweets! Thanks for sharing this recipe, it looks gorgeous!! This is not a ceviche, it’s a salsa! those photos are absolutely stunning, what a gorgeous location! 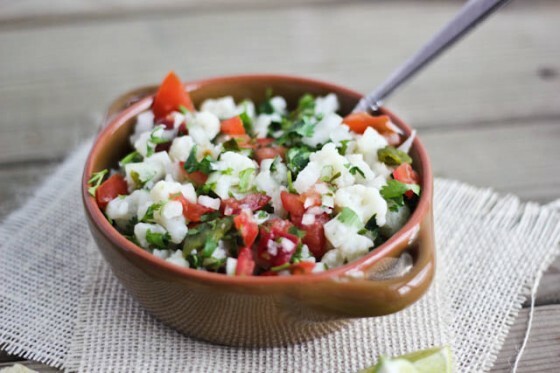 Cauliflower ceviche sounds so cool! I’m already a huge fan of the regular, fishy varieties of ceviche, so I can imagine that the cauliflower version is totally awesome. And what a fun night out! This sounds wonderful. If you don’t mind me asking, did Chef Cuevas roast the serranos?